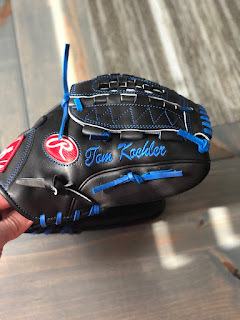 Newest Dodger hurler Tom Koehler just got a new glove, via a pic on his twitter. This Day in Dodgers History: In 1972 Sandy Koufax was elected in the Baseball Hall of Fame -- become the youngest player to ever to be enshrined. In 1983 the Dodgers traded popular third baseman Ron Cey to the Cubs for Vance Lovelace and a minor leaguer. Happy Birthday, Dolly Stark & Shawn Tolleson! Via Oliver Macklin at MLB.com; "New job with Dodgers has Prior excited for '18." "It happened pretty [quickly] over a couple days, and next thing you know, they offered me the job and I took it," Prior said. "I'm excited about the role. I'm excited to work with Dave Roberts and his staff, work under [Rick] Honeycutt and see how the Dodgers go out and prepare to try and win ballgames every day." Via the Manitoba Post; "Winnipeg Goldeye Wes Darvill Becomes an LA Dodger." On Wednesday, Darvill’s Goldeyes contract was purchased by the National League champion Los Angeles Dodgers. He will report to the Dodgers’ spring training complex in Glendale, Ariz., next month where he is expected to compete for a roster spot at the Double-A level. Getting a new trainer might have been the reason he went form struggling .262 hitter to the best third baseman in the league – and the 73rd Goldeyes contract that has been sold to a Major League organization. Source: Dodgers sign ex-Marlins INF Donovan Solano to minor-league deal. Was most recently in Yankees organization. 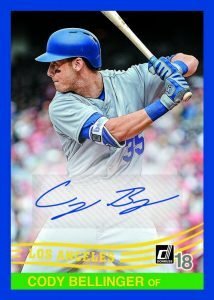 Rich Mueller at Sports Collectors Daily shares some preview pics from Panini's 2018 Bonruss flagship Baseball card set; including the Cody Bellinger card seen on the right. Go here to check out more preview pics. OMG! Dead & Company are scheduled to play at Dodger Stadium on July 7th! WooHoo!!! You should join me on the bus. You won't regret it. Go here for more information. Tickets go on sale on January 26th. The 2018 Topps Baseball collecting season has already begun. Sure, we're still a couple weeks away from the release of their flagship set, but on-line the collecting madness has already started. 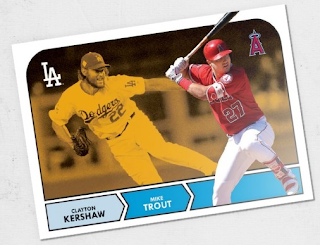 Available today is their third 'Throwback Thursday" set, and it happens to include a Clayton Kershaw card paired with Mike Trout. Check it out below. Go here to order.